I would love to help test your product. I have been in Wargaming for over a half century, played many games & computer/video games. Having designed rules for miniature games myself I know the amount of time & effort that goes into making a product and I feel my experience in the industry would add value to your product. You’ve been added to the beta tester list. Yes, count me in Ezra. I’m very much interested in your game and would like to join the beta testers team, if still possible. I appreciate your blog and the effort you’ve put into this. The map editor and Force creator appear to work just fine. However, I was wondering what the ‘Kriegsspiel Strength’ indicates? for explanation of Kriegsspiel strength. Basically, General Staff is two kinds of wargames in one: a very detailed simulation and a simple Kriegsspiel type game. I’d like to be a beta tester. If you still need beta testers I would love to help. I’ve added you to the list. You should receive an email shortly. Is the beta test still open? I would love to try this, just what i`ve been looking for. If you are still looking for testers I would be very interested. I am a veteran wargamer.. Gaming since the late 50’s I have experience as a user in Vassal and a gamebox designer in Cyberboard. I would love to see what you are offering and test it’s possibilities. I’m interested in beta testing. Long time fan of war games and computer war gaming, would love to be a beta tester! 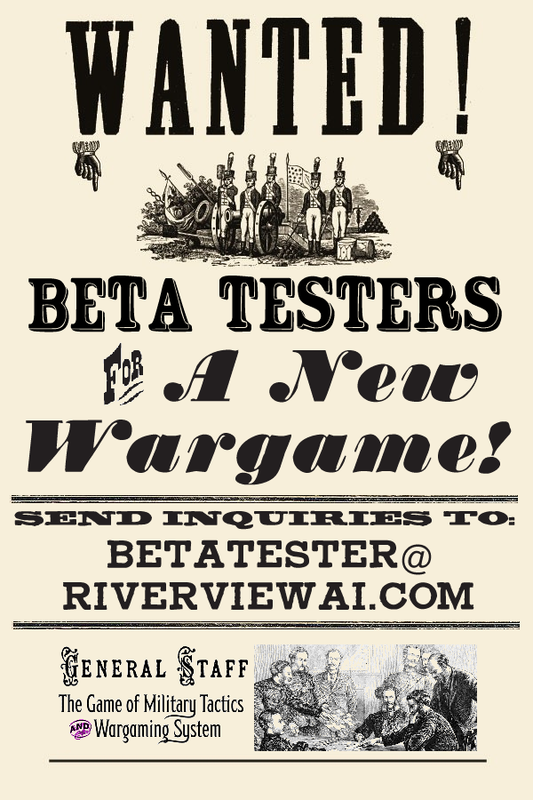 Send me an email at BetaTester [at] RiverviewAI.com.